Kaleidoscope Muff: Life in B.C. B.C. = Before Computers. I’ve become so accustomed to our digital world, that it’s hard to remember how I managed before the advent of these technological advances. When I watch old movies or read books which take place before the 1990s, I’m reminded of the simpler life, but I’m not sure I could ever return there. I’ve always used computers in my adult life because of the newspaper work I did. The papers were one of the first to move into the computer age. Gone were the noisy typewriters and handwritten copy. Reporters and ad people balked at first, but they soon learned that computer copy was better and easier. Linotype machines and hot lead gave way to offset and then straight computer generated printing. 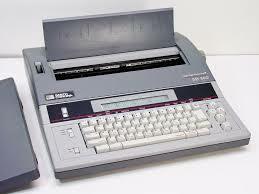 At home, I moved from my regular electric typewriter to a word processing one. It was so much easier to type and see the words on the little screen than to be using white out all the time. However, such a machine could only store five hundred words. If I were writing a long paper for class, I’d have to write it out longhand, then type in the first part until I ran out of memory. I’d ‘print’ it out, and check for errors, and then print it again. Finally, I’d move into the next sections of the paper and repeat the steps. It seems ridiculously long and involved now, but back then, it was considered innovative! I remember when I first heard about the internet, I had no clue what they were talking about. My brother tried to explain it to me, but it seemed like science fiction! I relented and got signed up for this ‘new-fangled’ object, and my world came alive. I tried to get other teachers involved at the start, but I got some very strange looks. Then it took hold of everyone. I still didn’t understand what it was all about, but I was getting hooked quickly. Do you remember your early days on the internet? Were you as enthralled as I? I would get lost there – looking up one idea, then going farther and farther until I forgot how much time had elapsed. When email came into common use, I tried to get others to join in. What good was it if I had no one with whom to communicate? I remember always asking, “Do you have email?” Then came the shopping routine! I had always done a lot of catalog shopping – I think I was on everyone’s mailing list! I had stacks of catalogs, and I’d often order from them for gifts and clothes. But when I found shopping online to be so much easier, I chucked all the catalogs and the computer became my mall. Now, even though I still patronize the brick and mortar stores, I much prefer Amazon or specialty sites. I rarely send letters anymore – it’s mostly email. I still read newspapers, but I get most of the news online. I blog and meet new and wonderful people through that channel. (My son calls them my ‘imaginary friends!’) I surf the web for information, and when I get tired of being in front of the screen, I change rooms and continue on my phone. Don’t even get me started on how much time could be spent on Pinterest! It’s just a whole different world. If I were standing here twenty years ago, and could see all of this virtual world, I’d never have believed it. Now, I can’t imagine life any other way! I love computers. I love the internet, especially after becoming disabled. But I have spent hours and hours fixing issues on my practically new computers. It's taken over my life! So I'm a but less rosy-eyed about it at the moment. However, I cannot imagine now living without computers and the internet. I don't even attempt to fix problems. I know I'd only make things worse! My son looks at the situation, realizes what's wrong, and fixes it. I'm so fortunate. While I may have moved along the technological road quickly, I never learned how to resolve errors! I went through the same googly eyed excitement that you describe! We would get the biggest computers out at the time, they would say it will last forever because it will hold so much info.....those were dinosaurs days! I dont know how to live without the net and my imaginary friends lol now. Isn't it strange that at one point, bigger computers meant more storage? Now, we have little tiny devices that store more! I did not have that googley eyed excitement about new technology...I was the one being dragged by folks like you. My initial experience with a computer was: But what does it DO??? Now I could not live without it of course. Okay, Olgasaurus, but now you're pretty much really into it all. I had teachers who just absolutely refused to learn or try to do anything connected with computers. They missed out on so much! Ha! I will use that name now. you tell those boys we are very much real!! and we love you!!! i do LOVE technology and have never resisted moving forward and learning but at 56, i am feeling a lil maxed out!!!! I, too, avoid technology overload -- my brain can only hold so much!